When it comes to home repair issues that center on plumbing, gas, and electrical systems, many homeowners are understandably hesitant to pull out the tools and start a DIY project. The reason is that problems concerning these areas of functionality of the house require more than a little technical know-how to address, which is why most people are willing to shell out large sums to hire qualified, licensed professionals for the job. Its just not worth it to risk water damage, a gas leak, or electrocution. And when it comes to the tank that provides your home with hot water, youre going to be dealing with at least two of these areas (since the average water heater is either gas or electric). Even if you are confidant that you can complete troubleshooting and repairs yourself, it is important to take the time to check your local building codes to see if you need a licensed tradesman and/or pull a permit and schedule a building inspection. However, if you happen to be well aware of safety measures for tinkering with the water, gas, and electric in your home, and youre not particularly afraid of damaging your structure (or yourself) through your efforts, there are some common problems that you can pretty easily handle on your own. Suppose, for example, that your water is running cold. Whether your heated water turns cool after just a few minutes or you cant seem to get any hot at all, there are a couple of simple fixes you can try. For starters, youll want to make sure your tank is functioning properly. If you have a gas heater, all you have to do is remove the access panel and look for the pilot light (a flame the size of a candle or lighter). If it has gone out, there should be instructions for relighting it labeled on the tank. All you really have to do is turn off the gas, wait half an hour, turn it back on, and relight it. For an electric water heater, a good place to start is by checking the thermostat to make sure it is properly set, or trying the reset button (sort of like the GFI ones on bathroom outlets) to make sure it hasnt been tripped by a power surge or outage. But, if the power seems alright, it is likely your heater elements. Most units have an upper and a lower and simply screw into the side. Change them both while youre at it. Now, if you happen to have water that is only lukewarm, then turns cold after a few minutes, or that has a brownish color or sediment in it, your tank may be in need of a good cleaning. You can start by turning off the gas or the electricity to the tank and then shutting the intake valve (so no new water comes into the tank during draining). Allow the unit to cool for a few hours. Then you simply hook up a hose to the outlet (a spigot at the bottom of the tank), locate valves (one on the spigot and one on the top of the tank, usually), and then open the valves (first the bottom, then the top). Your hose should go to a large enough tank, a drain, or outdoors down the driveway to the street. The water may be full of sediment, so if you dont want a buildup on your lawn or a clogged drain, you might want to opt for a tank (try GoToTanks.com). Your local hardware store might also carry appropriate supplies. Thats pretty much it for this step. Once the water is completely drained you simply close the drain valve, open the water intake valve, let the unit fill, and restart your tank to see if youve adequately addressed the issue. You should perform this simple maintenance annually. Of course, it may not solve your problem, which means its necessary to replace the whole tank. 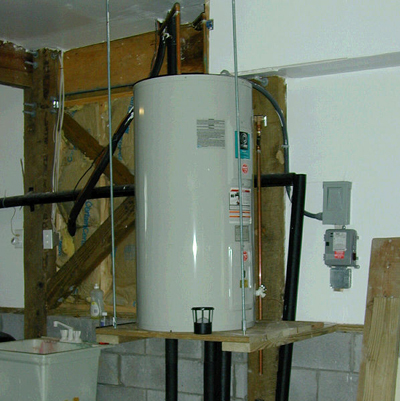 Why do Water Heaters Lose Capacity? Most municipal water supplies contain calcium and other hard minerals. These minerals crystallize and build up in a honeycomb formation over time. Of course, this displaces available water. If you need to replace the unit, do not buy a self-cleaning model. It sounds good, but it simply passes the mineral into your home where the clog things up. If you are replacing, keep in mind that tankless water heaters are a modern option that can help you cut back on energy consumption and save you some money on utility bills. But you might want to call in a plumber before you decide your particular problem is something that cant be fixed.